I hope you guys are in for a fun one today because I’m ridiculously excited about this post - taking these snaps filled my design and decor loving heart with so much joy and that’s in large part due to the fact that this space was expertly decorated by one of my favorite people on the planet and the person who sparked my love of home design and decor, my beautiful mom! I’ve been dying to photograph my parents’ home here in Arizona for some time now because it’s such a unique space that was so lovingly executed, and feels so authentic to the tranquil, picturesque corner of Phoenix in which it’s nestled (the hills… of Fountain Hills. See what I did there?!). And as luck would have it my parents are saying goodbye to this Southwestern style Territorial gem and moving within daily hugging and hangout distance to their adorable grandbabies (and of course my sister and I… but let’s be honest, mostly the grandbabies), which means two things: I had to move fast if I wanted to finally get some snaps of this beauty and that some lucky family gets to scoop up this hillside retreat and live the life all of my desert dreams are made of. So today we’re giving this space the celebratory sendoff it so deserves! 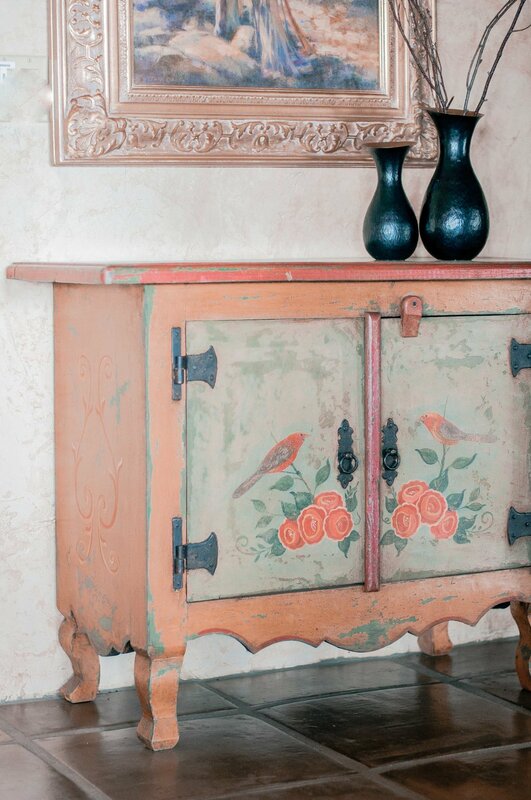 As all of you know, Southwestern style is in many ways a world away from our home decor and design style in our own home here in our little corner of Phoenix, but I have such a love and appreciation for the way the style oozes cozy, warm, rustic, casual, lived-in vibes, while also utilizing color, pattern and texture in the most interesting, exciting ways. Admittedly the style didn’t always completely resonate with me, but at some point something inside me shifted and I fell head over heals for the warm, comfortable, relaxing, restful environment my mom had created inside this home and now I just can’t get enough. I always tell Chris that our next home (in my dreams, of course), may look a little something like this. If I’m being completely honest, I think my appreciation for what’s happening inside this space is partially due to the fact that over the last year or so, I’ve felt a little bit uninspired by seeing basically the exact same space replicated over and over again on Pinterest and Instagram with little variation and what feels like so little personality or character. And I’m as much guilty of that in our own home as anyone else, so I only have myself to blame really. Send help! It’s because of those sentiments that I’m doubly excited to feature a home here on the blog that’s so different that what you’re used to seeing from us, and hope you guys are pumped for a little change of pace and inspiration, too. As I was snapping these and capturing some of the details around the house that I love so much, it also occurred to me that this style is pretty foreign territory for me. As in, I had absolutely no idea that the actual architectural style of the home was known as “Territorial” until my mom so kindly educated me. As you guys know I have zero professional credentials on the design front, and am constantly learning and absorbing new things from people much smarter, more creative, more experienced and generally more talented than me - I’m just a professional design appreciator and I’m completely OK with that designation because I genuinely have so much love and passion in my heart for it. Every single part of it! That said, I thought it would be much more fun and valuable for you guys on this one to have the person who actually poured their heart and soul into decorating the space tell us all about it than to have a neophyte like me say a thousand words about how much I just love everything with no real wisdom or storytelling to be had. One of the things that struck me when I was snapping these pics around the house and something that kickstarted our conversation is how ahead of the trends it all feels. 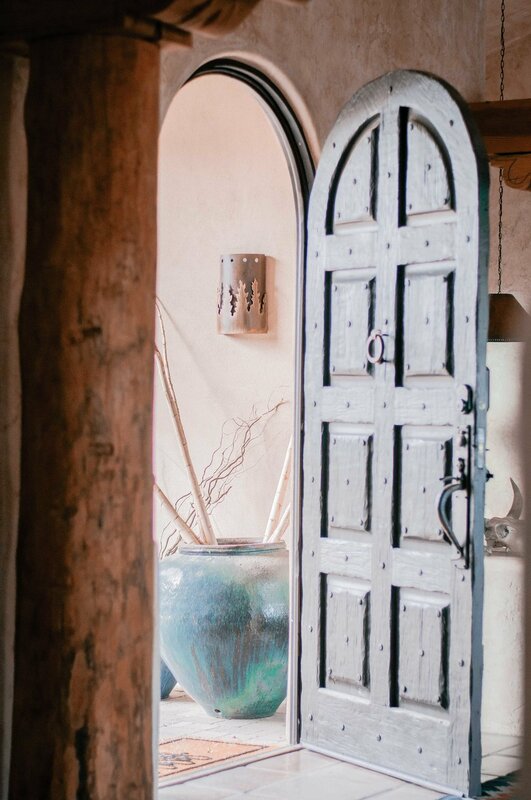 They bought this house 13 years ago, before Pinterest and the like and now Southwestern style is a bonafide trend on Pinterest and Instagram with easy, affordable big box store sourcing for so many of the things you see here. What’s more, the style of this house is so drastically different than the homes you see in Michigan or any of the homes she’s decorated before, which also got me wondering where she found inspiration or education for a style so drastically different than what she’s familiar with. So many questions… so little time. 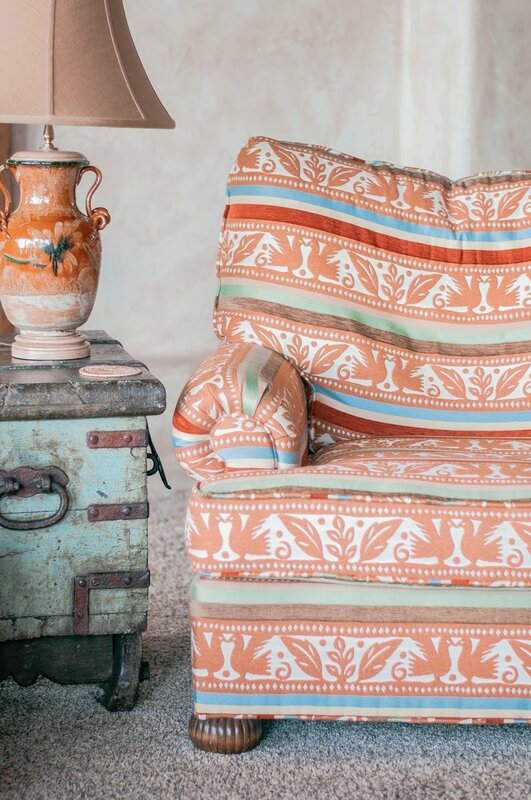 So without further ado, a little Southwestern style chat with my favorite lady! She described that when they were looking for a home somewhere in the general Phoenix area, she was drawn to a traditional Territorial style that really felt like the classic Arizona, Phoenix and American West in general that she so fondly remembers from her time visiting with her parents when she was young. She remembers walking around Old Town Scottsdale with her family and it feeling so authentically Western with cowboys walking up and down the street, and strong Native American and Mexican influences all around. 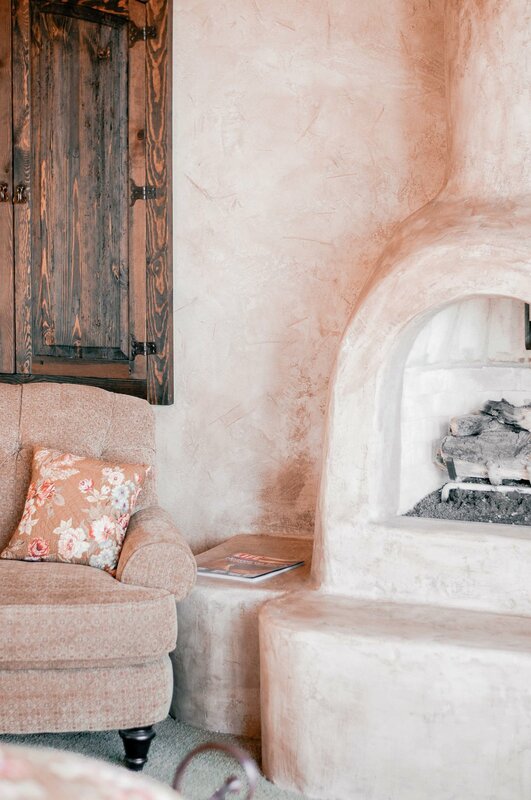 So she wanted their home here to feel like the traditional Territorial ranches she remembers seeing in the surrounding areas of Phoenix when she was young, that mixed cozy and rustic with its own brand of Southwestern luxury. She also laughed a little bit and said that she recognizes that native Arizonans may look at a Territorial style home the same way a Northern Michigan native might look at a log cabin - too literal, too kitschy. But she really just wanted the home to have a sense of place. To fully capture the spirit of what she feels makes Arizona such a special place. When they found this house it was nearing completion, and the the builder and his wife took a lot of care in encompassing a thousand unique design details that were authentic to a traditional Territorial style home, many of which you can see throughout the pics. My mom noted that the builder and his wife had a home down in Mexico and brought some of the crazy-cool design elements that you see in the pics like those really beautiful rustic wood bathroom vanities, the kitchen island, the bar, some of the big light fixtures and more up from Mexico to include in the house, which is part of what she thinks makes it so unique. And can we just talk about all of those exposed wood posts, beams and ceilings for a second? They’re one of my very favorite things about this style of home and one of the reasons these homes feel so warm and cozy. My mom noted that this is a pretty defining design element of a Territorial style home that’s probably found more often in Tucson than it is here in Phoenix (raise your hand if you’re as in love with the homes in Tucson as I am - So. Much. Charm. ), and something that further drew her to this particularly home. The beams are called “vigas” and the slim ceiling slats you see in one of the pics are called “latillas”. Another defining trait of Territorial style that’s included throughout that home that I simply can’t get enough of? 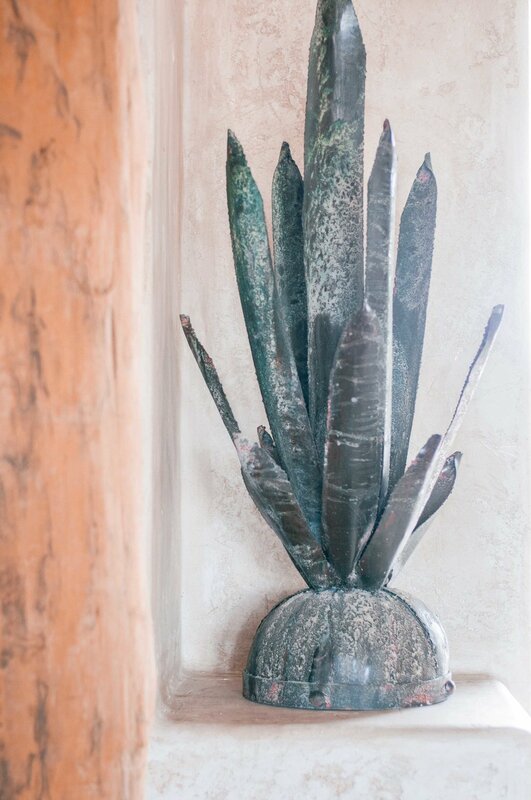 The indoor and outdoor “kiva” fireplaces that give almost every space throughout the home, whether inside or out, that extra dose of desert coziness, which was and remains another traditional element of Territorial style that sold her on this home. How could your guests not love cozying up to a fire in their bedroom during a visit? As I mentioned, I was dying to know where my mom pulled inspiration and education from in the pre-Pinterest era for a style that was so drastically different than what she was used to. The mystery of it all! When I asked what she love so much about Southwestern decor specifically, she said that it’s the combination of warmth and character. 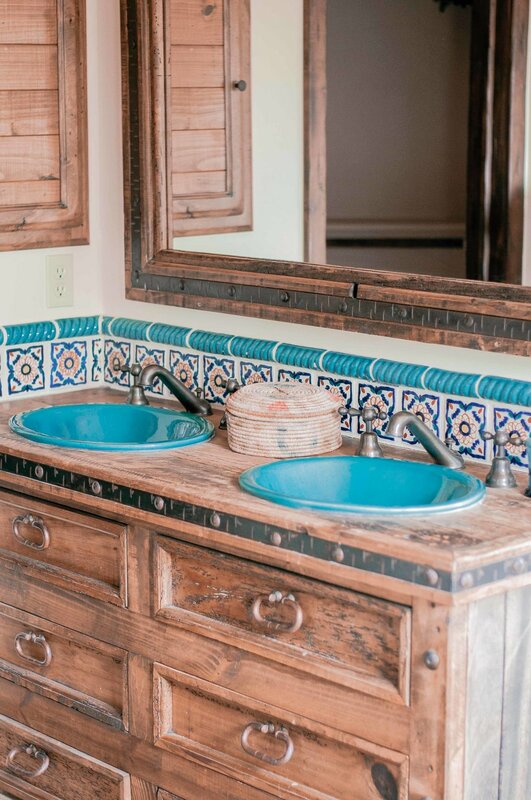 The ability to pair vibrant colors like blue and orange and spunky Talavera tile with rustic wood and some finery like lace and have it all feel completely natural. Like it’s all supposed to be there or would have been there if this home were one of those old Arizona ranches she loved so much. To blend lived-in and luxury all at once for a character-filled combination that feels so inviting. She said that at the time, she got a lot of inspiration from magazines and design books to educate herself on the history and evolution of both the architectural and decor styles, and all of the design and decor elements that define them. She said that in that time she learned so much about the tile, the textiles, functional elements, traditional colors and more and used that to inform her choices and build her dream home in her mind. She also noted that she was able to use all of the unique, one-of-a-kind design elements the builder and his wife had already included to inspire and guide the rest of her choices, which she says was really helpful in keeping everything cohesive. So I suppose the takeaway there is to use the architectural style to your advantage and work with and within it, not against it. A good reminder for our own home projects! Her approach to sourcing? I was surprised (and pleased) to learn that it’s not much different than how we outfit our own home. Some high, some low, some reproductions and some of the real thing, all dictated by the budget she gave herself prior to starting the project. She found a lot of the antique pieces at a gem of a high-low store in Phoenix that we both absolutely love, Scottsdale Marketplace, which is basically a big market that houses tons of unique decor, antiques and gifts of all kinds, from so many interesting vendors. We’ve both loved it for years and still love and utilize it to this day! She also said that at the time, pre-2008 and the economic downturn, there were tons of import shops in North Scottsdale that carried these beautiful pieces that were imported from Mexico, or that were importing reclaimed wood from Mexico and making their own original pieces out of it here. So she found a lot of what you see in the pics by visiting those over and over again over the course of about two years, and found everything from smaller decor items to rugs to mirrors to art to furniture pieces and more. Today, a lot of those places don’t exist anymore, which she says is a little bit sad because they were so unique and filled with really interesting people and pieces. Though she noted that there are still a few of those gems sprinkled throughout the area to visit. And like most of the homes in my family, whether it’s my parent’s homes, my sisters’ homes or our home, there are also a couple of items that have been passed down from my grandma’s homes, including the statue in the entryway that was once a beloved fixture at the lake house in Michigan that was always so interesting to me growing up. It’s a Madonna and child statue that my grandma and grandpa found in Mexico in the late 50s or early 60s when they visited for the first time, and she has no idea how they brought that thing back with them. I absolutely love that it now sits in this home here in Arizona, and it’s still just as interesting to me now as it was when I was a kid! It’s one of those unique pieces that always reminds me of my family. There’s also a blanket that my grandma brought back from a trip to Mexico many, many years ago that now lives in the house as well, and I think it’s found the perfect home now, don’t ya think? Feels right! 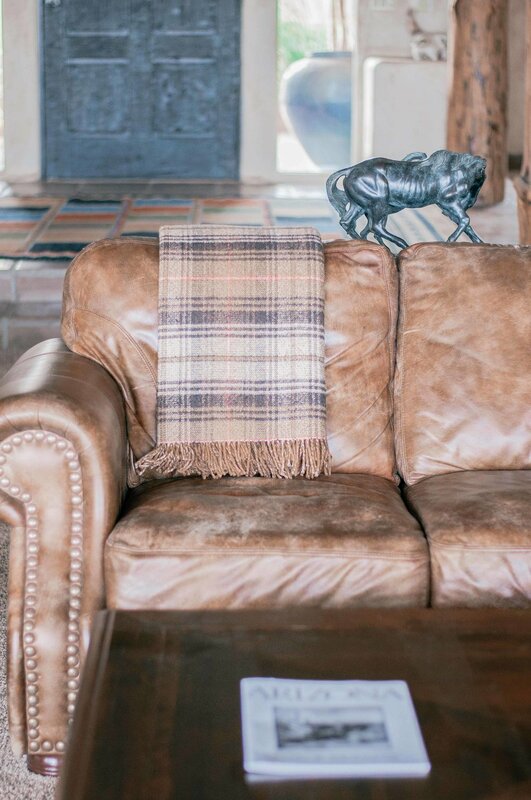 As mentioned, the rest of the blankets and the rugs around the house came from a lot of the same places I talked about above, but today there are about a thousand sites and stores where you can snag this look for less. Thanks, internet! My mom has always been a serious art lover, but like everything else, the art in this home is so much different than anything I’ve seen her choose before and I absolutely love it! We’ve never really taken a deep dive into her approach to art, though, which I’m especially curious about because I feel a little bit out of my element when searching for art for my own home. As in I know next to nothing about art and choose things solely because I enjoy looking at them… which I don’t feel as embarrassed about now after talking to her! This is what she said: “Art is personal. When it comes to art it has to speak to me. Whether the price is high or low doesn’t matter, I personally have to like looking at it every day. To make sense in my house, it doesn’t have to be expensive, it just has to make me happy. For me, art isn’t about pleasing other people, it only has to be pleasing to me. Whether it’s the color or the style or something else, my only requirement is that it has to make me feel good.” Yep, I’ll be taking that little nugget of wisdom with me for the rest of my design and decor loving life! She said that when it comes to finding art to fill your home, you just can’t rush it, and though she loves art, she finds it the hardest part of decorating a home. You have to be patient. She also mentioned an approach to furnishing and art that she learned from a friend that resonated with her and that she used while decorating this house - in every room, have a comfortable chair and 2 pieces of art and the space will come to life. Genius! Another nugget I’ll be putting in my pocket and pulling out whenever I’m needing a little inspiration. I feel like that’s kind of hygge, no?! Maybe not, but maybe it should be! In her search, she was looking for Western Art (art that captures the American West or the Old West) that wasn’t too kitschy, but felt like the rest of the house and captured the sights or scenes of Arizona and the American West in general. During that time she took a trip to High Point, North Carolina and found a couple of fun pieces, and she also found some bigger pieces at art galleries in Old Town Scottsdale, which houses so many incredible galleries filled with beautiful pieces by Arizona artists and other artists of the American West. In the end, some were vintage pieces and some were new. Some were super affordable reproductions that just fit the style and space and as mentioned, a few are the real thing. She also said that there are a few from each category - high and low - that she’s absolutely fallen in love with and would never let go. A lady after my own heart! How fun was this?! Slow clap for my super cool mom on this one. I love being able to snap and share the different, real, lived-in spaces that inspire me and in turn, hopefully inspire you guys… or at least give you some fun new design and decor eye candy to enjoy. So thank you guys for allowing me to step outside of our norm briefly and showing up for it - we hoped you loved it as much as we did. Make sure you drop a comment and tell me what your favorite part of this space is - I can’t wait to hear what you love!